These carrot cake cupcakes are tender with a punch of cinnamon in them. 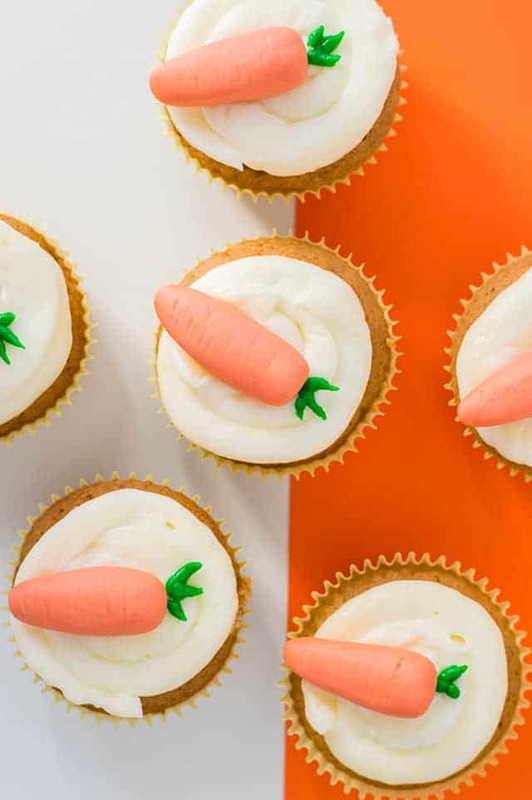 They’re topped with a cream cheese frosting and a cute fondant carrot. They’re the perfect Easter cupcake! Be sure to check out my carrot cake cookies too! Have you ever had Carrot cupcakes? You can’t taste the carrots, they just help provide an incredibly moist cake and maybe a little sweetness. 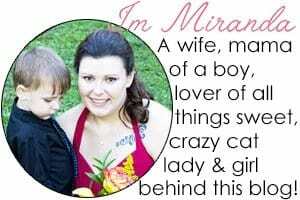 That might just be in my head though. 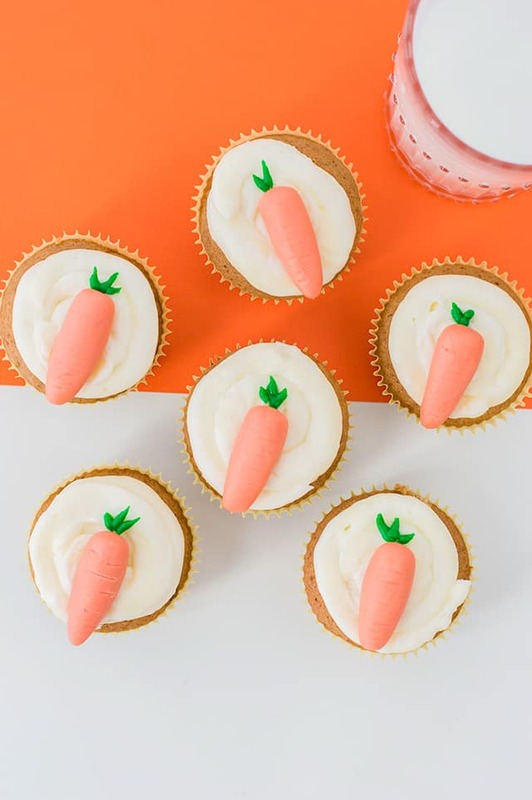 This carrot cupcake recipe has a 3/4 cup of shredded carrots which is equivalent to 2 to 3 carrots depending on the size of your carrots. The carrots don’t need to be peeled before being shredded unless you prefer them that way. Preheat oven – The oven should be preheated at 400 degrees. Fill your muffin tin with paper liners. Combine dry ingredients – In a mixing bowl, add in the flour, baking soda, baking powder, salt, cinnamon, and nutmeg. Whisk them together until thoroughly combined. Set aside. Mix wet ingredients – In a large bowl, add in the vegetable oil, sugar, eggs, and vanilla extract. Beat with an electric mixer until combined. Combine ingredients for batter – Begin adding the dry ingredients into the bowl of wet ingredients in thirds. Beat with the electric mixer until combined before adding more dry ingredients. Fold in grated carrots – Using a spatula, fold in the grated carrots until evenly distributed. Fill cupcake liners – scoop the batter into the prepared muffin cups. Fill 3/4 full with batter. Bake carrot cake cupcakes – Bake for about 20 minutes. Let cool completely before frosting. 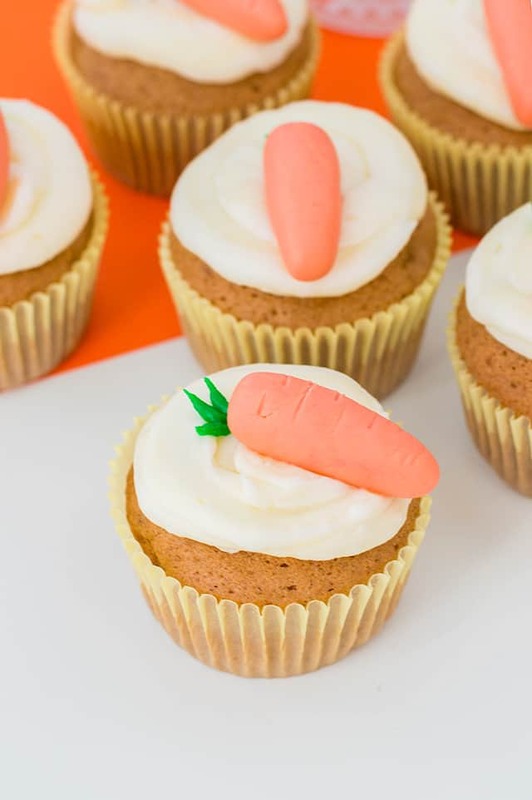 I decorated my carrot cake cupcakes with cream cheese frosting and little fondant carrots. Cream cheese frosting is the popular frosting to pair with carrot cake. Another great way to pair cream cheese and carrot cake together is with a carrot cake cheesecake. 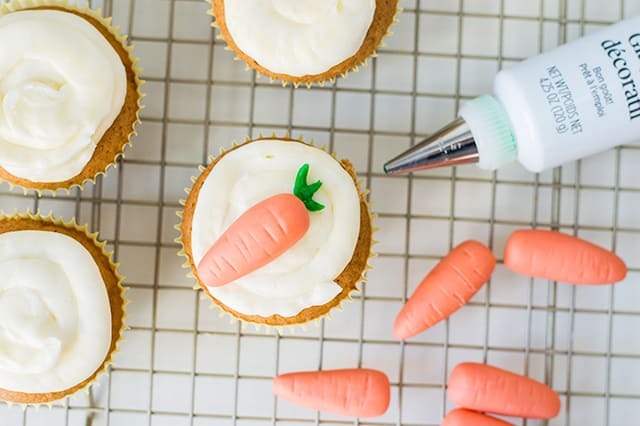 Begin by adding your frosting to a piping bag fitted with a Wilton 1A tip. Pipe a tall swirl of frosting on top of the cooled cupcakes. Now it’s time for the carrot cupcake toppers. I like to get colored fondant because coloring it yourself can become a pain. It gets sticky. I bought orange fondant and divided it into 10 pieces. I like to start by rolling the fondant into balls. Then I begin shaping it like a carrot by rolling it back and forth in my palms until it’s about 2 inches long and 1/2 inch thick. It should look like a baby carrot. Next, flatten out what will be the top of the carrot where the greens are. Gently press the other end to taper it off to form a pointish end. Use a toothpick and carefully press some lines into the carrot. 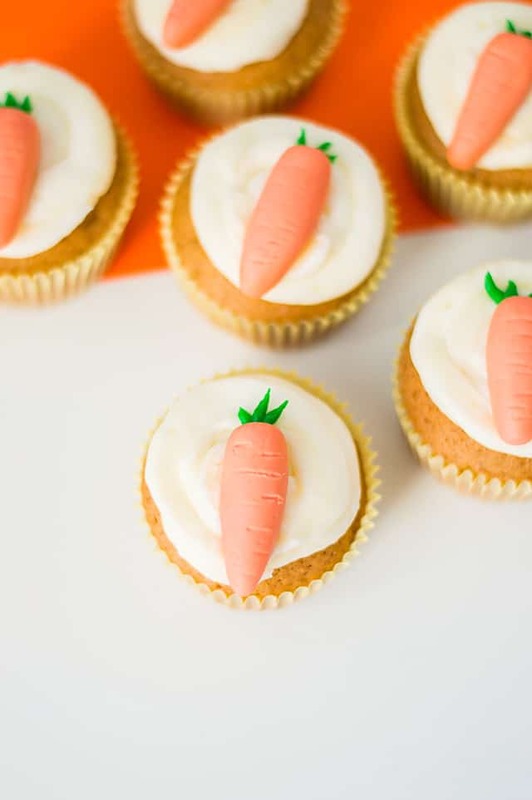 Pop a carrot on each cupcake. Make sure there is room on the flat end to add some greens. You should have some cream cheese frosting leftover. Add a little leaf green gel paste food color to it until it’s a vibrant green color. Add it in a piping bag or sandwich bag with a small round tip. Pipe 3 green leaves to the top of the fondant carrot. In my experience, kids seem to love the fondant toppers. Everytime I make a cake, the kids always flock to the fondant. Maybe because it’s straight sugar? Who knows. Store carrot cake cupcakes in an airtight container in the refrigerator because of the cream cheese frosting. If you’re substituting the cream cheese frosting for an American frosting with just butter, powdered sugar, milk, and extract, it can stay out at room temperature. I wouldn’t frost the cupcakes if I wanted to freeze them. Save that for when you are ready to serve them. There are four simple steps to freezing a cupcake. Wrap cooled cupcakes individually in plastic wrap. Throw the plastic wrapped cupcakes into a freezer bag or a freezer-safe storage container. To thaw, pull the cupcakes out of the freezer, immediately remove the plastic wrap, and let them come up to room temperature. Leaving the plastic wrap on them while they thaw will likely make the tops of the cupcakes stick to the plastic wrap. How Long Do Carrot Cake Cupcakes Last? In the fridge and properly stored, I would say 5 to 6 days. Preheat your oven to 400 degrees. Line a muffin pan with cupcake liners. In a small bowl, whisk together flour, baking powder, baking soda, salt, cinnamon and nutmeg. In a large mixing bowl, add in the oil, sugar, eggs, and vanilla extract. Beat with a hand mixer on medium until combined. Once your wet ingredients are incorporated, slowly add 1/3 of the dry ingredients. Beat until the dry ingredients are worked in. Repeat with the last to thirds of the dry ingredients. Once the ingredients are well-combined, fold in the shredded carrots. Scoop the batter into your muffin pan and fill ¾ full. Bake for about 20 minutes or until a toothpick comes out clean when inserted in the center of the cupcake. Allow to cool completely. In a mixing bowl, add in the cream cheese and butter. Mix until light and fluffy. Add in the powdered sugar and heavy cream. Mix until incorporated. Turn the mixer on high and beat for another 2 minutes until the frosting is fluffy. Add the frosting into a piping bag with a 1A tip and pipe swirls on the cooled cupcakes. Divide your orange fondant into 10 1-inch balls. Roll out each ball into a 2-inch long shape and ½ an inch thick. It should resemble a baby carrot. Flatten the top of your fondant carrot where the leaves will go. Work the other end with your fingers to give to taper it off and give it a sort of point. Use a toothpick to score some lines on the fondant carrot. This will give it some realistic texture. 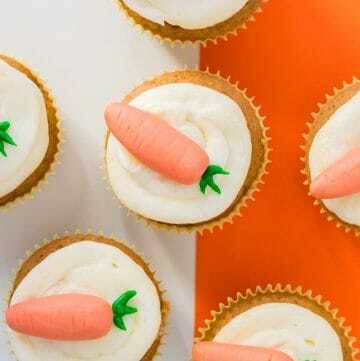 Place a fondant carrot on top of each frosted cupcake. Color about 1/4 cup of the leftover frosting with leaf green gel food color. Place in a piping bag fitted with a small round piping tip. Add 3 green leaves to the top of each carrot.